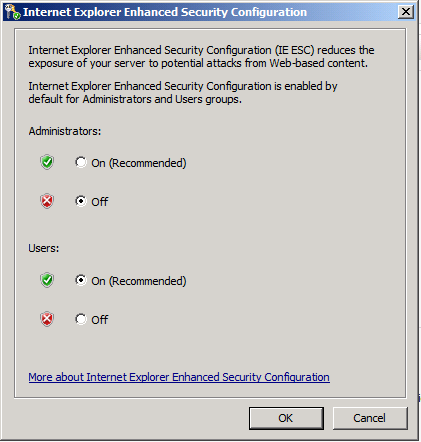 How do I disable Internet Explorer Enhanced Security Configuration on the SBS Server? The default installation of SBS 2011 Essentials and SBS 2011 Standard has Internet Explorer configured in Hard Admin mode. Microsoft made the decision to do this in order to protect the server itself when people attempt to surf the Internet from it. The downside to this is that many server applications such as Trend Micro WFBS, use a web interface to manage the product itself. Accessing this on the server console is the typical method of configuration of the product and therefore IE Enhanced Security being configured in Hard Admin mode makes it more troublesome. In these circumstances, the easiest way to resolve this problem is to disable Internet Explorer Enhanced Security Configuration for the Administrator users. You should of course NEVER use the servers Internet Explorer to access the Internet as this could lead to your system becoming compromised. To disable Internet Explorer Enhanced Security Configuration on the SBS 2011 Server, follow this procedure. 2. 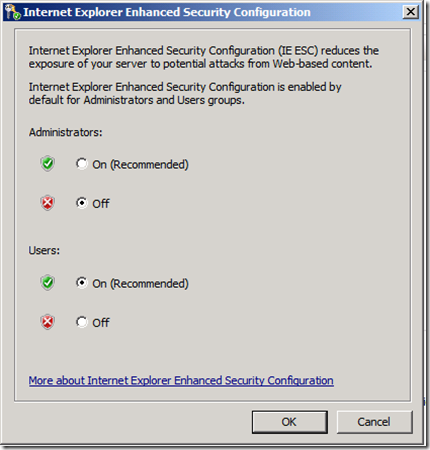 Select the Configure IE ESC wizard under the Security Information section on the right hand pane. 3. Change the default option for Administrators from On to Off and select OK.
4. If you had Internet Explorer open, close it and restart it. 5. Internet Explorer will now be running in Soft Admin mode. Ok – so that’s it. If you’ve followed this procedure then things like Trend Micro WFBS Security Console will work just fine on the server itself now. NOTE: IT IS NEVER RECOMMENDED TO ACCESS THE INTERNET USING THE INTERNET EXPLORER ON THE SERVER CONSOLE. USE A WORKSTATION INSTEAD TO ENSURE YOUR NETWORK REMAINS SECURE. I am running SBS 2011 essentials SP1 and I can not find the security setting in Server Manager. Is there some difference?